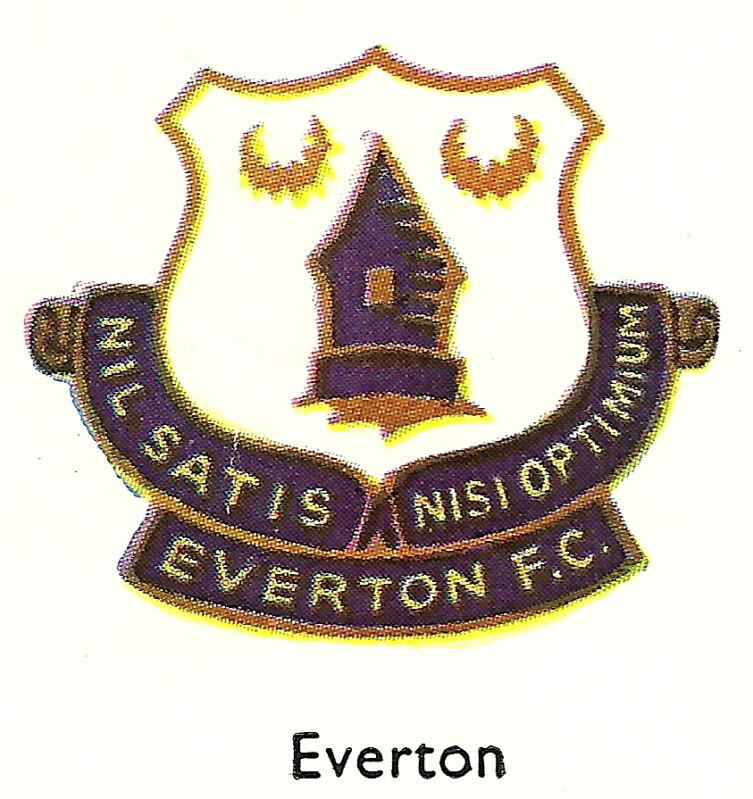 Like many football clubs Everton have recently redesigned their club badge, the reason being given was because “the old style crest is not condusive to the new style media” accompanied by a claim that a recent survey found young fans did not understand the relevance of the tower on the original crest and so it was felt that the new design will appeal to the younger generation of supporters. Now call us old fashioned but surely fans should be proud of their football clubs heritage and younger fans should be educated as to what their clubs history is all about? Then again they havent actually got rid of the Tower so its a bit of a mystery exactly why they did it isnt it, merchandising reasons perhaps ??? Anyway, back to the history of the badge. The badge below is taken from The 1959 Encyclopedia Of Sport and shows the original crest as it was back then. The “tower” that figures so prominently on the badge is based on an actual building, and its not a Toffeee shop as some will have you believe. It is in fact known as Prince Ruperts Tower (or The Round House) which was used as a lock up in days of old. 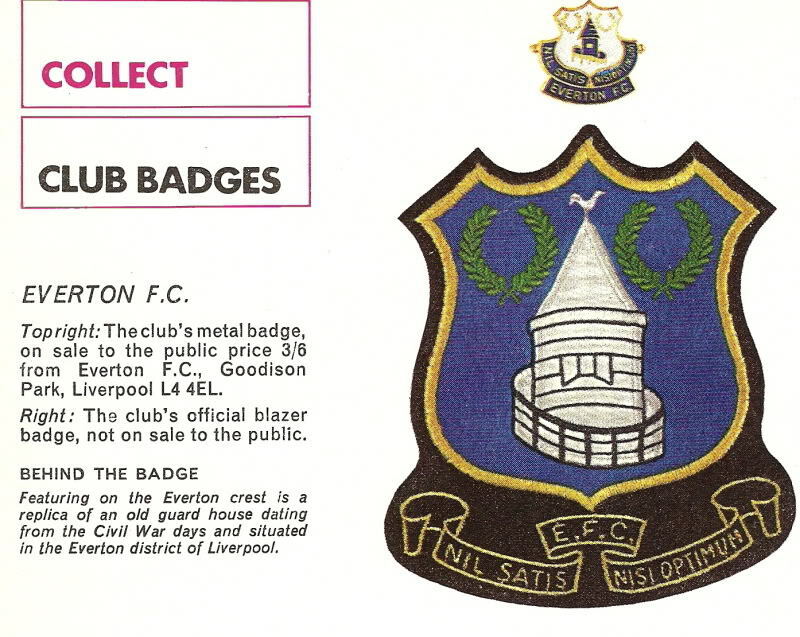 Apparently it was adopted for the club badge in the late 1930s because it was situated on Netherfield Road in the Everton district so was therefore deemed as representative of Everton. Another picture which shows the badge in a bit better resolution is this one taken from an early 1970's Football Review magazine, as you can see the two shapes around the tower are actually wreaths, these were supposedly chosen to accompany it as they are accepted symbols of winners. In common with a lot of football clubs a Latin motto was chosen - NIL SATIS NISI OPTIMUM` which has two common translations, the first being “Nothing Will Do But The Best” and the other “Only The Best Is Good Enough”. Finally we've shown another version of the same badge, this one was taken from the Esso Football Badge collection in the early 70's and is slightly different from the official badge, we think though this was just Esso applying some artistic licence !! So there we are, a potted history of the Everton football badge, to save us falling foul of copyright law we cant show you the new crest but basically the only changes are the addition of the year 1878, the year the football club was formed, and the team name underneath it.